Sulzer’s Birmingham Service Centre is tackling a local skills shortage by continuing to invest in apprentices that are keen to learn new skills, as well as working towards full-time employment in a vibrant and challenging industry. Specialising in mechanical and electrical repairs of large rotating equipment, the centre for UK operations is now looking for four new apprentices to join the programme in September. As one of the world’s leading providers of maintenance solutions for clients in the oil & gas, water and power generation industries, Sulzer is keen to maintain its excellent knowledge base and also train new talent for the future. In Birmingham, the apprentice programme has been running for more than five years and it has produced several qualified engineers that have taken up full time positions within the business. Dan Moore, Operations Management Team – Traction Department, comments: "The industry in general is in very short supply of electrical repair capability as apprenticeships in the late 1980’s basically became a thing of the past and this has created the current skill gap. The apprentice programme is essential for the continuity of the business and finding the right candidates is essential; we are looking for people who have an aptitude for electrical and mechanical repairs and want to get their hands dirty." The Birmingham Service Centre works with its training partner, In-Comm, which is a training academy that offers a wide range of development programmes delivered in a real working environment. The apprentices study a framework which has been developed by Sulzer’s technical team, in consultation with In-Comm and the skills council that oversees the relevant NVQ programme. In the first year apprentices are based at In-Comm on a full-time basis, where they will learn basic mechanical engineering skills, such as machining, grinding and reading engineering drawings. The block release at college allows the apprentice to learn basic electrical skills and principles and complete the elementary grounding that is so important. 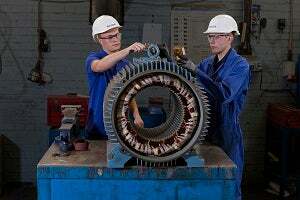 The second year sees the apprentices returning to the Birmingham Service Centre where they will spend three months in each specialist department, Mechanical, Rewinds, High Voltage Coils and Traction. In each case a basic skill set is covered and the apprentices are assessed on their ability and level of interest in the sector. The end of year assessments will see those apprentices that show sufficient aptitude being encouraged to complete a three-year BTEC in Electrical & Electronic Engineering as part of their development. Based on the assessments in year two, the apprentices will return in the third year to spend six months in the department that best suits their skill set. Once again, there will be assessments during this period to gauge the development and understanding of the apprentices. There is no automatic progression through this programme and those that do not manage to achieve the required standards, either at work or at college, will not be able to complete the course. For those that make it to the fourth year, it will be clear which department will be most suitable for the candidate after a number of reviews and the natural electrical or mechanical bias of the apprentice. The next 12 months will be spent gaining more experience and learning more complex skills in the final department. Dan Moore concludes: "The apprenticeship programme has been designed to meet the needs of our diverse range of businesses, from small to medium electrical machines to large scale mechanical engineering. With such a shortage of engineers in the UK, both male and female, we are looking for four new apprentices to start in September, with three of them preferring the electrical side of the business and one to learn a range of mechanical skills. Each applicant will be assessed independently and we would welcome anyone interested in this sector to apply."